Clean Energy Qualifies for Ballot! 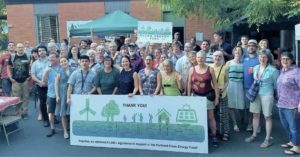 Progress for Clean Energy in Portland! The League of Women Voters of Portland supports this clean energy measure. We are pleased to share this press release from the campaign. (PORTLAND, OR) – The Portland City Auditor Elections Division sent news late today that the Portland Clean Energy Fund (PDX 04, the “Portland Clean Energy Community Benefits Initiative 2018”) received enough valid Portland voter signatures to qualify for the November 2018 ballot. A sampling of 55,509 submitted signatures revealed 39,755 valid signatures, over 5,000 more than the 34,156 signature threshold for the City of Portland. The announcement means that Portland voters will decide this Fall on funding clean energy projects including housing upgrades, living-wage jobs and job training, and green infrastructure. More than 150 organizations and businesses and over 50 elected officials, public figures, and faith leaders have endorsed the Portland Clean Energy Fund Campaign. A full list of endorsements, more information, and the full text of the initiative is available at www.portlandcleanenergyfund.com. Previous Previous post: Just Updated: Multnomah Co. Directory of Elected Officials! Next Next post: Juvenile Justice: What’s Needed?